We are offering three hours of expert salsa tuition in a single day because that’s just enough to lay the foundations of salsa dancing and enough to really feel you’ve got somewhere. If you are a total beginner, or been dancing for months and want to sharpen your skills to get that much needed boost to your confidence and dancing. Then this course is perfect for you. The course will offer much more than a single lesson once or twice a week. Our instructors will give the group an intensive program that will get you dancing much more confidently. The focus will be on learning quickly in a very relaxed fun atmosphere. All our staff are very friendly and encouraging. Beginners. From 0 – 4 months experience. Improvers From 4 – 24 months experience. Held at PUTNEY Salsa Club! The famous salsa club in the heart of West London. It’s easy to find and it’s the perfect venue to learn to dance salsa. Come on your own or bring your friends. We constantly swap partners so the classes have a real buzz but we limit the size so everyone can get direct focus. If you get stuck the many assistants are on hand to help. 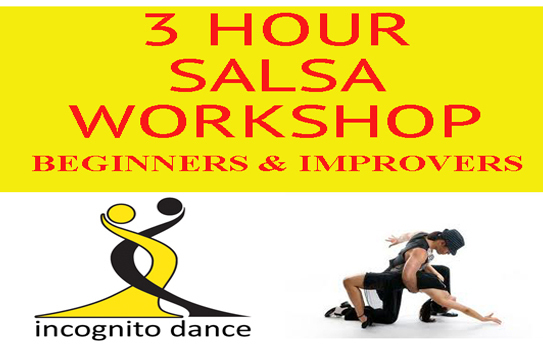 Relax, you’re in safe hands, after 12 years of teaching salsa, Incognito Dance Company understand the pitfalls and will help you avoid them. Just relax, have fun and learn a little Latin flavour.